With 2 Conference Rooms, maximum seating in theatre style for upstairs Skyview Conference Room is 50 delegates, downstairs Pool Terrace Conference Room is maximum 30 delegates, both Rooms with overhead projectors, flip charts, white boards, TV and video available. A compact mini studio unit with a Double bed, compact desk with chair, en-suite bathroom with shower, single tub armchair, tea/coffee and toast making facilities, kitchen bench and sink, cutlery & crockery, compact fridge, microwave, electric jug. The room has a 32” LCD TV with Sky and Freeview channels plus DVD player. This compact unit provides great budget value, cosy and comfortable room for individuals or couples who do not require a full kitchenette. This room can be interconnecting with Room 3 to create a Two Bedroom Unit – Available on special request and subject to availability). An appealing studio unit with a Queen bed, in room double spa bath, en-suite bathroom with a shower. Single tub chair. Dinette table, desk and chairs. Cooking facilities, hi-resolution 32” LCD TV with Sky and Freeview channels plus DVD make this perfect accommodation for relaxing after an enjoyable day in the Bay Of Plenty or a busy day working. Free Wi-Fi broadband. An appealing studio unit with a Queen bed, in room double spa bath, en-suite bathroom with a shower. Two seater tub couch, dinette table, desk and chairs. Cooking facilities, hi-resolution 32” LCD TV with Sky and Freeview channels plus DVD make this perfect accommodation for relaxing after an enjoyable day in the Bay Of Plenty or a busy day working. Free Wi-Fi broadband. An appealing studio unit with a Queen bed, in room double spa bath, en-suite bathroom with a shower. Cooking facilities, a desk and hi-resolution 32” LCD TV with Sky and Freeview channels plus DVD make this perfect accommodation for relaxing after an enjoyable day in the Bay Of Plenty or a busy day working. Free Wi-Fi broadband. An appealing studio unit with a Queen bed, in-room double spa bath, en-suite bathroom with a shower. Cooking facilities, a desk and hi-resolution 32” LCD TV with Sky and Freeview channels plus DVD make this perfect accommodation for relaxing after an enjoyable day in the Bay Of Plenty or a busy day working. Free Wi-Fi broadband. An appealing studio unit with a Super King bed, in-room double spa bath, and en-suite bathroom with a shower. Two tub armchairs for relaxing, dinette table, desk and chairs. Cooking facilities, hi-resolution 32" LCD TV with Sky and Freeview channels plus DVD, make this perfect accommodation for relaxing after an enjoyable day in the Bay Of Plenty or a busy day working. Free Wi-Fi broadband. Super King bed can be split into two singles on request and splitting charge may apply. An appealing studio unit with a Super King bed, in-room double spa bath, and en-suite bathroom with a shower. Two tub armchairs for relaxing, dinette table, desk and chairs. 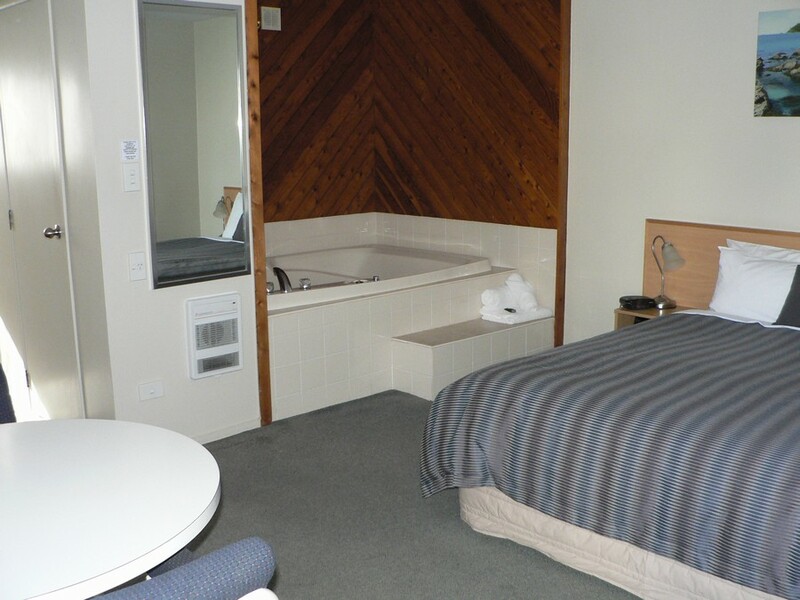 Cooking facilities, hi-resolution 32" LCD TV with Sky and Freeview channels plus DVD, make this perfect accommodation for relaxing after an enjoyable day in the Bay Of Plenty or a busy day working. Free Wi-Fi broadband. Super King bed can be split into two singles on request and splitting fee may apply. An appealing studio unit with a King bed, in-room double spa bath, en-suite bathroom with a shower. Two tub armchairs, Dinette table, desk and chairs. Cooking facilities, hi-resolution 32” LCD TV with Sky and Freeview channels plus DVD make this perfect accommodation for relaxing after an enjoyable day in the Bay Of Plenty or a busy day working. Free Wi-Fi broadband. This unit has a Super King bed in the bedroom, with a Single bed and double sleeper couch in the lounge, en-suite bathroom with single spa bath and separate shower, cooking facilities, dinette table and chairs, single tub armchair, desk and chairs. 32” hi-res LCD TV with Sky and Freeview channels plus DVD. This is a great option for couples, colleagues or friends. Free Wi-Fi broadband internet in room. Super King bed can be split into two singles on request and splitting fee may apply. (this room can be interconnecting with Room 3A to create a Two Bedroom Unit – Available on special request and subject to availability). A modern one bedroom unit with a Queen bed in the bedroom and a Single bed plus a double sleeper couch in the lounge, en-suite bathroom with single spa bath and separate shower, cooking facilities, dinette table, desk and chairs. 32” hi-res LCD TV with Sky and Freeview channels plus DVD. Free Wi-Fi broadband wireless internet in room. A modern one bedroom unit with a Super King bed (can split into 2 Singles on request and splitting fee may apply) in the bedroom and a Single bed plus a double sleeper couch in the lounge, en-suite bathroom with single spa bath and separate shower. Cooking facilities, dinette table, desk and chairs. 32” hi-res LCD TV with Sky and Freeview channels plus DVD. Free Wi-Fi broadband wireless internet in room. A modern one bedroom unit with a Queen bed in the bedroom and a Single bed plus a double sleeper couch in the lounge, en-suite bathroom with single spa bath and separate shower, cooking facilities, dinette table, desk and chairs. 32” hi-res LCD TV with Sky and Freeview channels plus DVD. Free Wi-Fi broadband wireless internet in room. This room can be interconnecting with Room 15 to create a Two Bedroom Unit – Available on special request and subject to availability. A modern one bedroom unit with a Queen bed in the bedroom and a Single bed plus a double sleeper couch in the lounge, en-suite bathroom en-suite bathroom with shower over single spa bath. Has hand shower and shower chair with self-draining floor for wheelchair guest. Cooking facilities, dinette table, desk and chairs. 32” hi-res LCD TV with Sky and Freeview channels plus DVD. Free Wi-Fi broadband wireless internet in room. A great one bedroom unit with a Super King bed in the bedroom and two Single beds in the lounge, en-suite bathroom with single spa bath and separate shower. Cooking facilities, dinette table, desk and chairs. 32" hi-res LCD TV with Sky and Freeview channels plus DVD. Free Wi-Fi broadband wireless internet in room. Super King bed can be split into two singles on request and splitting fee may apply. A great one bedroom unit with a Queen bed in the bedroom and two Single beds in the lounge, en-suite bathroom with shower over single spa bath. Has hand shower and shower chair with self-draining floor for wheelchair guest . Cooking facilities, dinette table, desk and chairs. 32" hi-res LCD TV with Sky and Freeview channels plus DVD. Free Wi-Fi broadband wireless internet in room. A versatile one bedroom unit with a Queen bed in the bedroom and two Single beds plus a double sleeper couch in the lounge, en-suite bathroom with single spa bath and separate shower, cooking facilities, dinette table, desk and chairs. 32" hi-res LCD TV with Sky and Freeview channels plus DVD. Free Wi-Fi broadband wireless internet in room.